It would appear that Chorley town centre is to become a vast and expensive building site over the next two years. Could I appeal to Chorley Council and others involved for some common sense? Leave things more or less alone, no demolition or construction? n Leave the Flat Iron as it is – we don’t want or need new stores. n Don’t demolish Hollinshead Street Church. It’s a lovely building and has been part of Chorley’s history for 250 years. Councillor Alistair Bradley, Leader of Chorley Council, replies: I appreciate Mr Tate’s view that he’d like to leave things as they are but my view is if we do that our town centre will suffer and decline like many neighbouring towns are doing. How people use town centres is changing and we need to improve Chorley to ensure it remains an attractive proposition to shoppers. I also appreciate the preference of adapting or using existing buildings. Unfortunately, many of those mentioned are not suitable for what businesses want and that is why they are choosing not to locate in Chorley at the moment and why we are looking at a new development. The proposal to demolish Hollinshead Street church only came about after the church approached the council because, for years, it has been in need of major repair and they themselves would prefer to move to new premises. We all have the best interests of Chorley at heart and this major investment is being made by the council because we want to continue to have a thriving town centre. Re: Closure of Chorley A&E. As concerned residents of Chorley, we find the situation farcical to say the least. If the Trust was a private company, this situation would have been resolved very quickly, but as the management seems incapable of any form of long-term planning and appear to be answerable to nobody, vulnerable patients are put very much at risk. Are we waiting for someone to die needlessly, due to being transported elsewhere, before any form of common sense prevails? The winter months will shortly be upon us, which usually results in a higher percentage of patients needing emergency attention. Without a local A&E, these patients will be put under extra stress which may result in needless fatalities. Please negotiate a prompt 24-hour opening of Chorley and District Hospital A&E Department. 2017 may be too late for some. Re: the letter, Here’s a win-win situation, (Guardian November 1). A little exercise for the youngsters would be a very good start for them in maintaining a future healthy lifestyle. If the parents get involved as well, even better. Anything which eases the problems faced by those living in the vicinity of schools would be a tremendous help. Our road, which is very narrow and has no pavements, is plagued by vehicles parking in an obstructive manner. Properties here have a covenant in the deeds, which, due to this narrow design, prevents residents from parking. Parents picking up their loved ones seem to be oblivious of the inconvenience they cause. I do hope that, R Spreadbury, you have also made the local and county councils aware of your suggestion. On November 3 we already had two weeks of fireworks – has the world gone mad?! We are supposed to be a nation of animal lovers – please give a thought to all the dogs, cats, horses, cows, sheep, plus all the wildlife – they must have been terrified. We all loved Bonfire Night when we were younger, but then it was one night, November 5, no other night, and they certainly were not as explosive as these are now. Next year, please, please try and keep the explosions to a minimum – think of your dog or cat. Mine was terrified! I welcome the government’s proposals to offer pregnant women the new non-invasive prenatal test (NIPT) on the NHS. 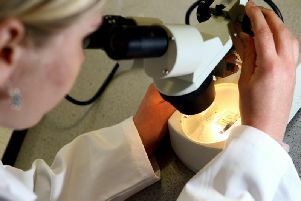 This test is a safer and more accurate test for genetic disorders than amniocentesis, but is currently only available in the UK if mothers pay for it, which can run into hundreds of pounds. With this new non-invasive test, parents will be provided with more detailed information during pregnancy and fewer women will have to suffer miscarriages. Sadly, this new test will only be available on the NHS from 2018. Perhaps if the Government wasn’t spending billions on foreign aid each year it could afford to introduce the test earlier. They are not a political statement. They are a grateful thank you to the millions who didn’t come home, and those who did. Still, the worst sanction FIFA can impose on us is a points deduction, and should that be a big one, we may not qualify, and that would save us from the usual humiliation! Can’t loose! I wonder if readers agree with me that we should give our ex-MPs a decent pension in order to save humiliating themselves and us on TV dancing and other silly game shows, or give them a seat with the other pensioners in the Lords. The closure of Chorley A&E is a disgrace on the British Government. If this country had any decency we would save it and re-open it immediately.